Flipping through the duty-free catalog on a recent flight, I was amazed that the luxury watches section spanned 38 pages and touted features like triple-polished sapphire crystals, 300-meter water resistance, rotating bezels and dual faces with multiple time zones. I nervously glanced at my own Garmin GPS running watch and its blocky digital time display. On the other hand, medical technologies (and the expectations of providers who buy and use the technology) should clearly be different. Innovation is focused on improving patient outcomes, and demonstrably better outcomes should command a premium price. Examples include remote monitoring to streamline patient care, increased image quality for diagnosing issues, and planning therapy and point-of-care testing for rapid decisions. The value proposition of those to customers should be clear. But many times it’s not, and manufacturers struggle to articulate how their devices and innovative features actually can improve outcomes. And, some innovations which have only a marginal impact on patient care, will no longer cut it in today’s outcomes-focused and cost-conscious environment. In recent years, the game has changed and the definition of value is becoming increasingly complex as more and more stakeholders get involved in decision making and priorities shift towards patient outcomes and away from features and price. Many in the industry have recognized the need to behave differently now. As payment models get more complex and quality metrics multiply, the industry needs to be much smarter. But often the challenge facing manufacturers is how to navigate these complex decision processes with a value proposition that compellingly describes the outcomes benefits of a product or portfolio. We recently completed a study of some of the most valued medical devices in the hospital environment and found five ingredients that are critical to an effective value proposition. 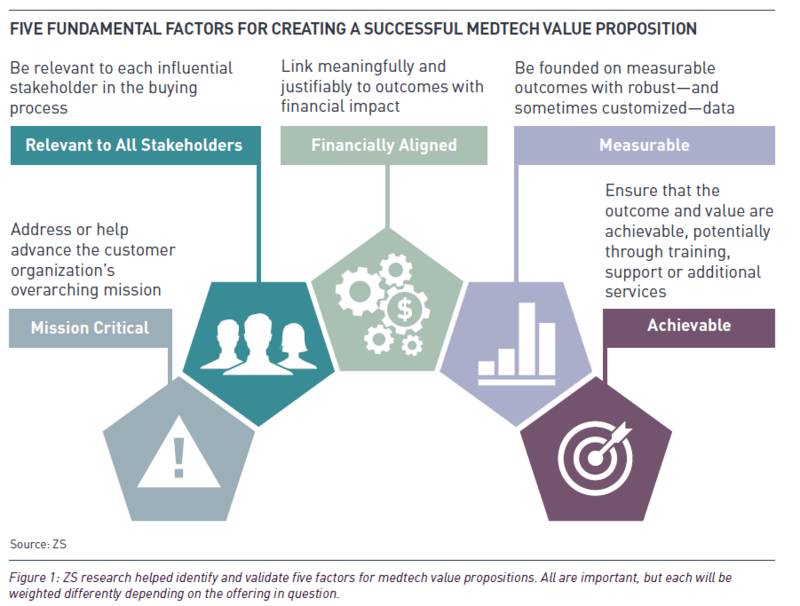 First, the value proposition should position the medtech offering as critical to achieving the customer organization’s mission. Second, the value proposition has to be relevant to each of the many influencers who now take part in purchase decisions. Third, medtech manufacturers have to meaningfully link their products or services to outcomes with financial impact. Fourth, the outcomes need to be measurable, and manufacturers should be equipped to provide their customers with the necessary data. And fifth, manufacturers have to ensure that the outcomes and value that they’re offering are achievable, offering training or other support services if necessary. These five dimensions can be used as a test to determine a product’s value proposition and to predict the product’s chances of success. For example, knowing whether a product or service performs well against each measure can help the manufacturer understand if a product is ready to be launched. Manufacturers also can use these five tests to carefully consider and clean their pipeline. If one crucial ingredient is missing, then smart marketers can identify services or studies to bolster the presentation. Despite the compelling product descriptions in that duty-free catalog, I didn’t order a watch. Not a single one of those features convinced me to retire my Garmin and go for the five-figure price tag. To hook me, the retailer would have had to focus on outcomes and on proof that those outcomes are achievable—for example, demonstrating how the watch could enable me to manage my time more effectively. Medtech manufacturers would be wise to take the same tack. In today’s evolving hospital environment, features simply aren’t enough: Products must create and demonstrate indisputable value. Brian Chapman is a Principal in ZS’s Zurich office and leads the consulting practice for ZS’s Medical Products and Services team. While at ZS, he has worked with companies on a range of sales and marketing issues, including sales force effectiveness, organizational design, opportunity assessment, channel design, new product launch strategy, value proposition development, territory alignment and incentive compensation. Having spent time working and living in the U.S., Europe and Asia, Brian has significant experience with global projects. Brian is a frequent blogger on ZS’s medtech blog, The Pacemaker.